Employers should ensure that they have both an updated Drug and Alcohol Policy which includes language around Fit for Duty, and an Off-Duty Conduct Policy that governs employee behaviour both in and out of the workplace during the workday. 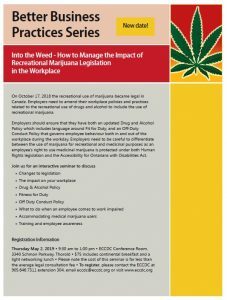 Employers need to be careful to differentiate between the use of marijuana for recreational and medicinal purposes as an employee’s right to use medicinal marijuana is protected under both Human Rights legislation and the Accessibility for Ontarians with Disabilities Act. Registration fee includes continental breakfast and a light lunch.